This entry was posted on June 25, 2013 at 8:58 am and is filed under efficiency assessments, Physiology, Training. You can follow any responses to this entry through the RSS 2.0 feed. You can leave a response, or trackback from your own site. Wow. That’s a lot of data to absorb. As I’ve no way of measuring HRV, I may get the ithlete monitor and app. I could probably work out a repeatable procedure using the Concept2 erg, as ‘conditions’ would be the same on an indoor machine, rather than running. Phil Maffetone mentions how max HR changes in his book (depending on fitness) – reducing as one becomes aerobically fitter. That’s what I’ve found too — it’s easiest to get a high HR reading after I’ve had time off from running – for example, I recorded 159 in a 2.5k race (the second run back from my 24 days off) — and I didn’t sprint all out at the end of that race! It was easy to hit 159 and I didn’t feel stressed doing it. I’ve regarded my current max HR as 161. When I was fit last summer I would usually only get 157 or so as a maximum, and that was racing flat out with a sustained sprint finish. Anyway, interested in how the running method works. I should continue to monitor resting HR, even though it’s steadily reducing as I’m returning to fitness. Thanks for your comment. Resting HR is certainly a worthwhile measure, but the reason I have spent time designing this more complicated test is that I found that single measures such as resting HR or resting high frequency HRV are very sensitive to various different transient circumstances and hence difficult to interpret reliably. I will add an addendum to my post to explain in more detail why I have developed a test employing multiple different measures, and also discuss how in routine use it is probably best to focus on one key measure and only examine the other measures in detail when the key measurement is out of line with expectation. What a great post! You are so diligent in your search for the sweet spot of training/ good inflammation. I was wondering what your verdict on HRV would show. It sounds like a bit too high noise to signal ratio. What I also notice is after all your careful HR measurements your score of 16 on the how-tough-was-that record did flag up the need to rest. Well, maybe that’s enough? Do you ever get a high score on that subjective scale, but chose to ignore it because the HR data conflicts? I think this is a great step in the right direction! I have been tinkering with various metrics as well and I also came to HRrest, HRR and HRV as key markers of the training/recovery cycle. However, I have great difficulty using RPE for anything. I have a tendency to perceive anything slower than HM pace as being “easy” and anything faster than 1K pace as being “hard”. I just don’t have the granularity of perception a 20-point scale requires. Reliability of ratings of perceived exertion during progressive treadmill exercise. In your scheme, RPE is key to detecting the early signs of overtraining, so it’s important to get this right. Yet, I wonder what I could use instead. For HRR, I use the average HR measured over the last 30 seconds of a 75-second period of complete immobility. 60 seconds is the usual way of measuring HRR, but there is no real standard, and I find the average HR over the last 30 seconds of the 75 second-period eliminates variations due to the vagaries of reaching the state of complete immobility. But honestly, it only matters to be consistent in the way the measurements are taken. For HRV, I have been using ithlete, and I can confirm the ratings using that tool are as erratic as you would expect. I found it hard to use the HRV index to modulate my training. Too many factors appear to influence the measurements and many in ways that weigh as significantly as the type of training you did the day prior. I will look forward to your protocol focused on “running”. I also wonder how one would go about distinguishing improvements in running economy from improvements in cardiovascular fitness. That probably cannot be done with this type of tests. I feel that you have done yourself and all your readers a great favor by taking the time to put together such a tool. Thanks for those comments. I agree that reliance on subjective assessment of effort for the identification of over-training is not ideal, though I would emphasize that maintaining a heart rate just below the anaerobic threshold does becoming perceptibly more demanding as over-training develops. Other features provide supporting evidence. An unexpected decrease in the HR at the higher levels is a strong pointer towards over-training. Pat Vehrs and James George from BYU derive a regression equation for estimating vo2 max from a self-selected running pace that produces steady HR early in a run. The eqaution has an R=0.91 with vo2 max. Here is the equation. VO 2 max (mL • kg − 1 • min − 1 ): VO 2 max (mL • kg − 1 • min − 1 ) = 58.687+(7.520 × Gender; 0 = woman and 1 = man)+(4.334 × mph) − (0.211 × kg) − (0.148 × HR) − (0.107 × Age), where mph = self-selected jogging speed, HR = steady- state HR (bpm) while jogging at level grade at the self-selected jogging speed, kg = body mass, and age = age in years. I really like that the pace is self-selected as this allows for a structured incorporation of perceived exertion. I am not sure that the Vo2 max estimates hold for ages over 40 (although putting in a recent run of mine it looks to work out pretty well. As long as the relation between running speed and hr are generally stable at the selected exertion level when not in a over-training or fatigued state within an individual then using this simple formula and protocol should produce decent estimates of fitness/fatigue levels across time. All that is needed is to run with HR monitor and speed tracking watch and to start runs of on the flat while paying attention to a specific consistent perceived exertion level while finding a steady HR. I think I will use this rather than HRV recovery to track alongside the HRV data I am tracking. As you mentioned the HRV recovery seems unstable in the first few minutes post exercise. It would be troublesome for me to wait and collect it at long time frames, and this sub-maximal running measure looks to probably be a better quick fitness/fatigue indicator as well. If you are interested, and don’t have access to the paper feel free to ask me additional questions. It provides very similar information to that provided by the mid-aerobic phase of my three level submaximal (running) test. However, I use (pace/HR) as the measure of fitness whereas Vehr and colleagues use (constant + pace – HR) as their measure of VO2max. Vehr’s ‘constant’ is modified by gender, weight and age. Over the course of a few months these quantities are fairly constant, though I think that allowing for variation in weight is likely to produce a useful increase in precision. Although I have no independent estimate of my VO2 max, I will see how well the estimation of VO2 max obtained by applying Vehr’s formula to my submaximal tests correlates with my own estimate of my aerobic fitness. You have provided me with some interesting things to look at in my own data. At present I am fairly busy. I hope to do a post on nutrition next week-end and then after that I will turn my attention to the issues your comments have raised. I will be very interested to hear about your own experiences with the Vehr test. What I specifically like about the Vehr approach is that you are running to a perceived exertion, not to a specified speed or HR. So both speed and HR can vary. I tend to have an ‘easy’, & a ‘comfortable’ perceived pace that I can subjectively find pretty well. If the formulas works correctly then the fitness estimate on a given day in theory when fresh early in a run should be similar at either pace. Also pace and HR may each have have different slopes (or standardized regression betas) relative to fitness estimation which direct (pace/HR) would not capture. I look forward to your nutrition post. I have been paying close attention to that aspect for quite awhile. I agree that the issue of perceived exertion is very important. First I should say that in the mathematical expressions I used in my reponse to your first comment above, I omitted several additional ‘constants’ for simplicity. These ‘constants ‘ are not strict constants but vary according to various circumstances including stress level. Nonetheless, both Vehr’s equation and my implicit equation both reflect the fact that for a given pace, low HR indicates greater fitness, while at a given HR, higher pace indicates greater fitness. My equation assumes a different mathematical form of the relationship that would affect the predictions over a large range of pace or HR, but over a small range, the variation is linear (as is assumed by Vehr). I deliberately specify that HR is measured at a near constant pace in each of the three stages, so both my test (in either the low or mid-aerobic stage) and Vehr’s test should yield virtually identical sensitivity to fitness change. 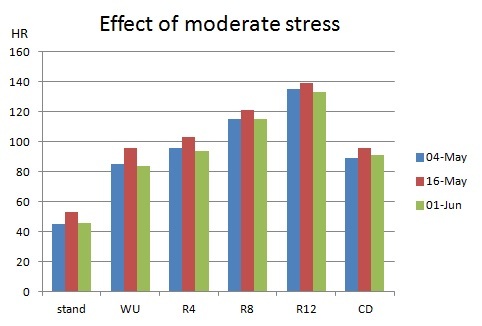 However the crucial issue is the fact that stress level affects the ‘constants’, During over-reaching, HR will be higher for a given pace. Therefore you can identify the development of over-reaching by noting when HR increases at a given pace despite an increase in training , using either Vehr’s test or my test. 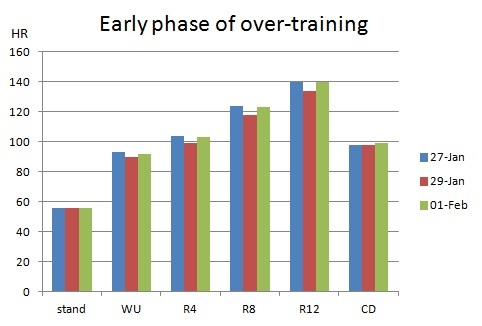 But in the case of serious over-training, HR actually decreases at a given pace. The challenge is how best to identify the difference between improved fitness and over-training. In part this is based on the fact that the decrease in HR at a given pace is more dramatic when over-training occurs, but even more importantly, over-training is revealed by the fact that the effort to achieve a given pace is increased. With Vehr’s procedure, you identify serious over-training by noting that your pace at a given effort is much lower. In my test, you note that a higher effort is required to achieve a given pace (or power output). Furthermore, I deliberately included three levels of pace including low, mid and upper aerobic range. In my experience, the increased subjective effort is most easily detected in the upper aerobic zone. So in conclusion, I think the two tests are likely to have a similar sensitivity to changing fitness in the absence of over-training. Both will be sensitive to over-reaching. But I suspect my test might give a more sensitive indication of the onset of serious over-training because the increased effort is likely to be most noticeable in the upper aerobic zone. Provided there is no likelihood of serious over-training, the upper aerobic part of my test colud be omitted, and in this situation, my test would yield very similar information to Vehr’s test. Vehr’s test is a bit simpler to do and could easliy be incoprtated into the warm up of every training session. In both tests, awareness of effort is crucial if serious overtraining is to be identified. 1)	At both paces it seriously over-estimates my VO2 max, giving values around 54 for data from very easy running and 56 from mid aerobic running, whereas true VO2 max at the time was about 43 ml/min/Kg. I suspect the discrepancy is due to the fact that I almost certainly have a larger than average cardiac stroke volume, so HR is lower than anticipated by Vehr’s equation, though maybe Vehr’s equation also requires a difference adjustment for age in the older age range. 2)	Vehr’s equation gives consistently higher values of VO2max when applied to mid aerobic running compared with easy jogging. 3)	It does show an increase in VO2 max of about 2 ml/min/Kg during a period when my fitness increased, and this is probably a reasonable though approximate estimate of the magnitude of change. 4)	The percentage change in VO2max is less than the % change in HR/pace but that is to be expected. In effect Vehr’s test, my sub-maximal running test, and a simple measure of beats/Km all assess change in HR at a similar low speed, as fitness improves and therefore all will be similarly sensitive to change in fitness. 5) The relative advantages/disadvantages of the Vehr’s test, my test and assessment of beats/Km are in regard to sensitivity to over-reaching and to serious over-training. I think all three are similarly sensitive to over-reaching as this produces increased HR at similar pace despite continued training. I think it is likely my test will prove to be most sensitive to the distinction between reduced HR due to increased fitness and reduced HR due to serious over-training because that distinction is probably easiest to make by estimating effort at a given pace in upper aerobic zone. Both Vehr’s test and beats/Km are very easy to incorporate into warm-up for every session, whereas my full test protocol takes longer and is more complex to perform. Interesting and insightful comments as usual. I wouldn’t expect the Vehr formula to work well as a V02 estimate in older populations as it was calibrated on a younger group. The oldest participant was 40. It is also a very different measure to obtain a rough Vo2 (fitness) estimate for comparison across individuals, then it is to evaluate changes within an individual. As you indicate, I am not sure if an easy running measure will be sensitive enough to differentiate changes due over-reaching vs those due to over-training. If a HR measure during exercise is to be used to inform that days workout I think it needs to be extracted from an easy pace warm-up. This is why I would like to track the measure daily in comparison with training loads and HRV data. I expect there might be some U-shape relationship going on. I would expect fitness readiness on a given day to be more acutely affected negatively by the fatigue of training then by fitness improvements which accrue more gradually. It will probably take an accumulation of a good deal of data to find a meaning pattern assuming one exists. I had a crazy week traveling to Nor Cal, driving long hours and providing support for a family member who recently lost her spouse. My training was interrupted in what should have been a peak week (a month out from my marathon), and I lost my garmin watch leaving my backpack in SF. Anyway I did collect some data and will get back to posting weekly updates soon. It is true that Vehr’s test was not normalised for age across a range extending into late middle age, though I am not sure that age should affect the results that much. Daniels formula for computing VO2 based on velocity does not depend on age. This is consistent with evidence that running efficiency does not deteriorate much with age. Similarly the conversion of % HRmax to % VO2 max does not depend on age. So the estimate of VO2 max based on pace and HR depends only on age insofar as to HRmax decreases with age. The rate of decrease in HRmax with age is similar in early middle age and late middle age. When I used heart rate and speed data from my submaximal test in September last year to estimate VO2max, the speed and HR recorded in the low aerobic zone gave an estimated VO2 max of 45.9, while the data for the mid-aerobic zone gave a VO2 max estimate of 45.5. My Half marathon performance a week later corresponded to a VO2 max of 44 (based on the assumption of optimum performance, but in fact I performed a little worse than expected on basis of the previous race performances, so my true VO2max was probably slightly higher than 44). Overall, I consider the VO2 max estimated from my sub-maximal test was a remarkably accurate estimate of true VO2max. On the other hand, applying Vehr’s equation to the same data yielded VO2 max values of 55.2 and 55.9 from the low and mid-aerobic data respectively. I am sorry to hear that you have had a stressful time recently. Nonetheless, good luck with your marathon. I have after reading your comments I have read the various Lamberts papers, and some others. It does seem clear that there is considerably less variation in heart-rate during exercise at higher intensities then at easy paces. Thus the Lambert recomendations regarding the use of HRR from higher intensities. I initially used the Vehrs formula on my data at quite low intensities and the Vo2 estimate seemed reasonable. As with you however looking at somewhat faster paces the formula vastly overestimates my V02. Not sure how he was able to obtain such a high R on so many subjects. In any event, I don’t think the formula will be useful in the way I had hoped. This paper appears to shed light on a number of the contradictions I have been struggling with. The researchers collected HRV, HR, and HR during sub-maximal and maximal tests as well as baseline Vo2 and performance outcomes. HRV data was collected both supine and standing, and a functionally-overreaching group (competitive triathletes) was compared to a control. The study found that using weekly RMSSD averages they were able to link HRV findings to changes related to the overload period & a one week taper. I find it very interesting that for the functionally overeached group weekly averaged standing HRV actually increases during the overload period when performance is compromised, & then starts to decrease during a one week taper after which that group improves performance (supercompensation). This makes sense given my initial intuitions of my standing HRV scores in relation to fatigue. If you can access that paper you might want to check it out in full. The HR during exercise measures also concur with Lamberts findings as HR at the higher exercise intensities has the strongest relationships with changes across the overload and taper periods. That looks an interesting paper. I have not yet obtained access to the full manuscript . It is certainly plausible that a weekly average of RMSSD might provide more reliable estimate of autonomic state. The observation that HRV increases during the overload period is a little surprising, though I have occasionally observed something similar myself. Occasionally I have observed standing RMSSD over 180 (about double a typical value) during a period of heavy training, yet there was no other evidence suggesting serious over-training. Thus it does appear that in some circumstances parasympathetic excess is might indicate functional over-reaching rather than serious over-training. I have wondered about those very high RMSSD #’s you have mentioned in past posts. Using ithlete that never happened for me. I recall an occasional outlier using Suunto and the kubios software but nothing anywhere near that high for RMSSD? The trends for the functionally over-reaching triathletes in the study were pretty clear. 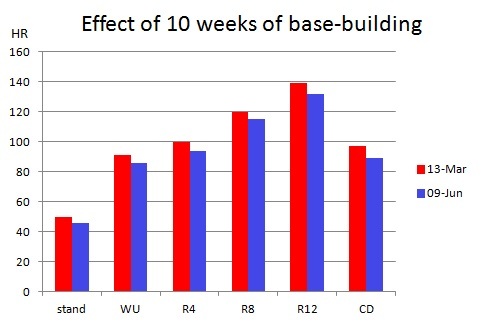 Performance went down in the 3 week overload period as did HR during exercise at various intensities (especially higher intensities ), while HRV (standing weekly average in particular) went up and HR at rest went down. Trends reverse after 1 week taper and this over-reached group performs well after taper. I am now thinking that I will track one day measure of HR at relatively hi intensity after an easy or rest day, along with weekly average HRV (standing & resting) and perhaps some measure of weekly training load and perceived fatigue. The daily graphs will then just fill in details, and this should make for an interesting analysis across a training block. AS you indicate, what the paper doesn’t enlighten is at what point does functional over-reach pass the threshold to over-training. Certainly seeing the over-reaching indications in a non-overload section of training periodation would be a sign to back off. Thank you for your article. I was beginning to think that I was crazy. 95% or more of the running information online talks about heart rate Increasing with overtraining. Mine has always decreased (I actually drove my body in to a deep hole believing that I was getting more fit, so I pushed it even harder). I perform a version of the tests that you suggest. aka morning orthostatic, graded moderate stress test and 1 minute recovery post exercise. For the moderate stress test I warm up and then run for 60 minutes on a Landice treadmill in our living room and use a Suunto watch to measure my average heart rate for those 60 minutes. To make sure that the conditions are as controlled as possible, I eat the same meal before workout, have the same electrolyte drink during workout, have the house at the same temperature, etc. My average heart rate for those 60 minutes averages 138 bpm (74% of tested max). However, sometimes it is very close to 138 several days in a row and then it will drop to 129 the next day. This pattern happens approximately 1 day out of 10. To make sure that it is not equipment malfunction, I have simultaneously worn 2 heart rate monitors (on different wireless protocols) measured on separate devices with similar results. Do you believe that this pattern is indicative of early overtraining, or should I be consulting a cardiologist for such a sudden and repeating change? Thanks for your interesting comment. As you imply, sudden drop in average heart rate on one day followed by a return to the usual level on subsequent days is not characteristic of increased fitness, but it might indicate the early stage of over training. It might be useful to record mood and sleep regularly for a period of a month or two, and see if mood or sleep disturbance precede the abrupt drop in HR as low mood or sleep disturbance often precede over-training. The original 65 question version takes about 5 minutes. Brian Mac discusses its applicability to athletes. Recording subjective level of effort during the session each day is also potentially a useful pointer, as I find increasing effort but lower HR is one of the clearest distinctions between over-training and increased fitness. With regard to the question of needing to see a cardiologist, I cannot comment, as it is necessary to take account of the full picture.